This narrow-width, 9,000-lb. HD-9ST four-post lift offers the same power and safety features of the HD-9, but in a smaller package. Some garages are just a bit too cozy for a standard-width four-post lift. The trick is to find a smaller-footprint lift that won’t sacrifice functionality. The HD-9ST is perfect for small garages and spaces that are already filled to near-capacity. Its narrow width is designed for spaces and service bays that need to fit more lift in less space. A slim lift is a smart choice for owners more compact vehicles. Because the HD-9ST features an open center, it doubles as both narrow parking lift and maintenance lift. 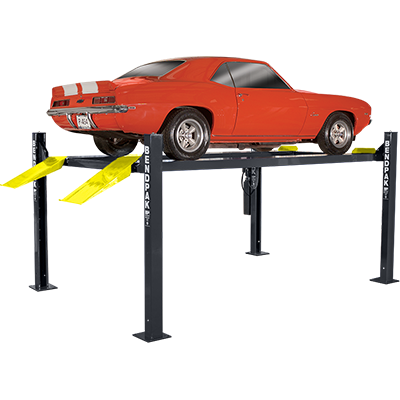 This makes it the ideal four-post lift for wrenchers with a limited amount of space. In addition to the narrow design, the columns are only 88” high, so it’s low-profile too. The runways raise to a max height of 75”, so the HD-9ST fits easily in low ceilings yet doesn’t sacrifice lifting height. Ample clearance underneath ensures that full-grown men and women over 6-feet tall will have no problem performing oil changes, comfortably adjusting transmission jacks and removing and replacing exhaust systems. Other lifts may sacrifice lifting height as they reduce their overall widths to accommodate smaller vehicles, but not this one. This is one four-post lift that’s every bit as comfortable to use as its standard-width and super-wide sister models in the HD-9 series. The HD-9ST may be smaller, but it’s not weaker than other designs, nor is it a hobby lift. In fact, this car lift is fully ALI certified. It’s used every day in professional shops around the world, and many motorists prefer it to the standard-length HD-9 simply because it leaves more room in their garage for tools and equipment.